The Agency elected a new Board and Marketing Committee at the AGM in London on August 14, and we’re looking forward to hitting the ground running with a new team of returning members and new faces. Along with that new Board and Committee, the Agency has elected a new Chair and Vice Chair in Heinz Reimer and Chad Ross, respectively. Heinz and his wife Elsie farm five miles south of Steinbach, MB, where the operation has been in the family for around 60 years. They typically run between 30-35 head on 170 acres. When he has any free time, Heinz likes to spend it with his grandchildren, practicing his golf swing or hunting. 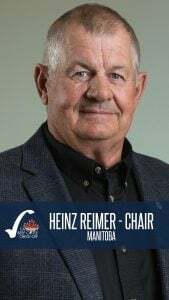 Heinz joined the Agency as the representative from the Manitoba Beef Producers in 2015, and became Vice Chair in 2016 before being elected Chair in August 2018. Chad grew up on a generational ranch south of Estevan, SK established 1905. He attended school in Estevan, participated in the 4-H Beef program then ventured to the US to further his education. 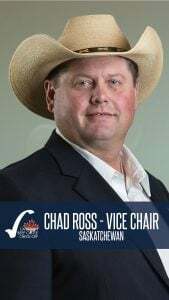 Chad is an aggressive and progressive beef producer and along with his family has spent countless hours promoting and growing agriculture for a sustainable future. Before becoming the Vice Chair, Chad spent two years on the Agency’s Finance Committee.